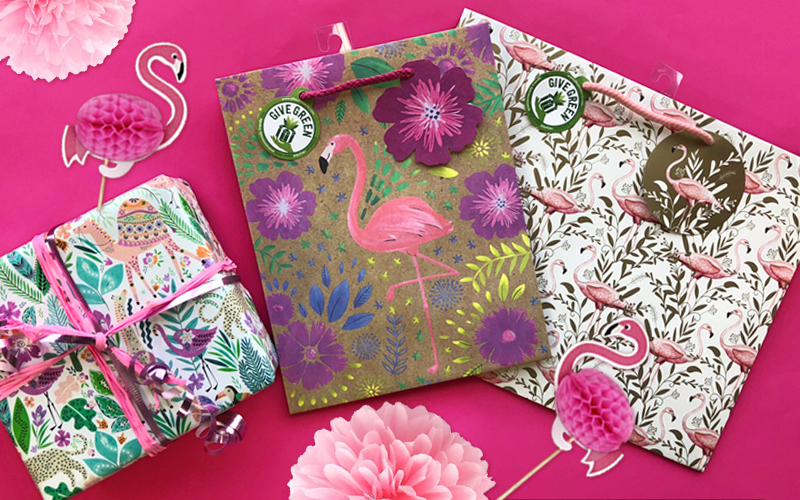 Fun and feathered, flamingos are totally on trend! 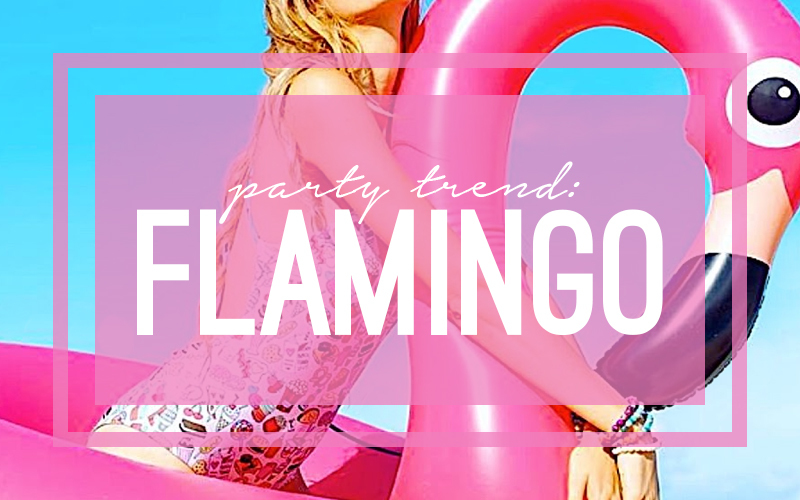 With their upbeat, colorful fun, they have officially gone from kitschy to cool. 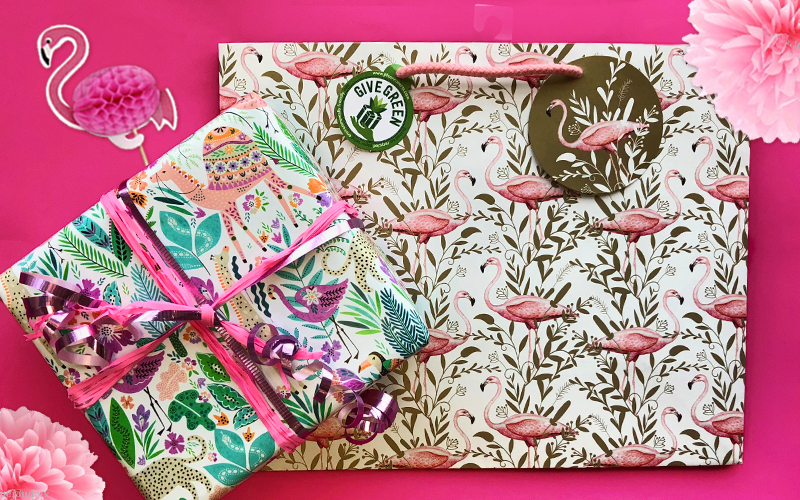 Use our collection of wrap and totes featuring these beauties to add a wow factor to all your gifts! 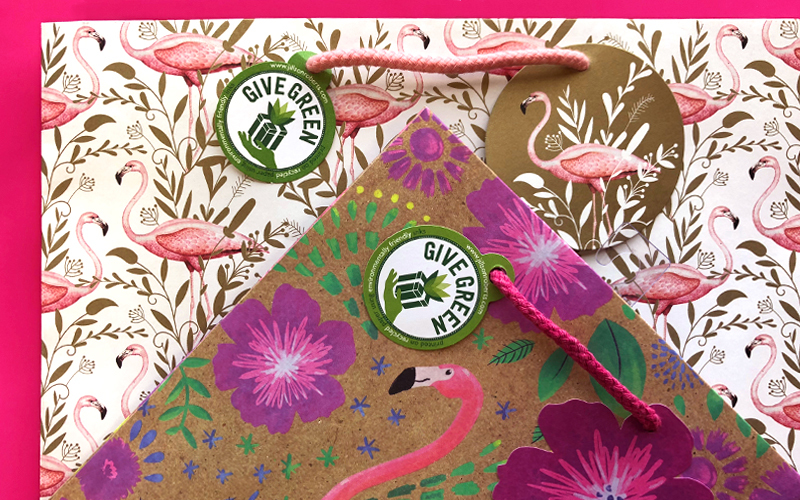 We especially love that these totes are part of our Give Green line. Which means they are 100% recycled! 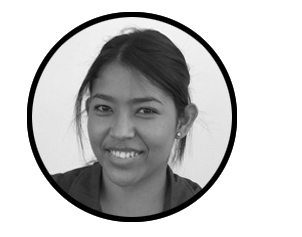 You can read more about our commitment to using sustainable practices here. 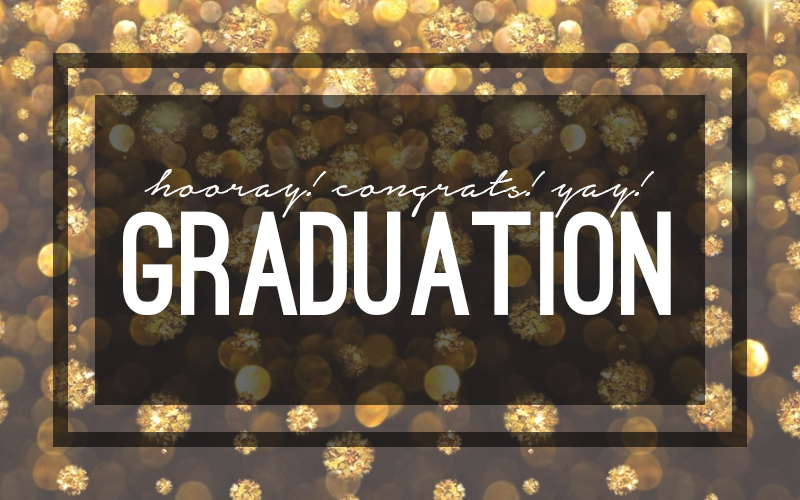 It’s that time of year again…time to celebrate and honor the accomplishments of all the graduates! 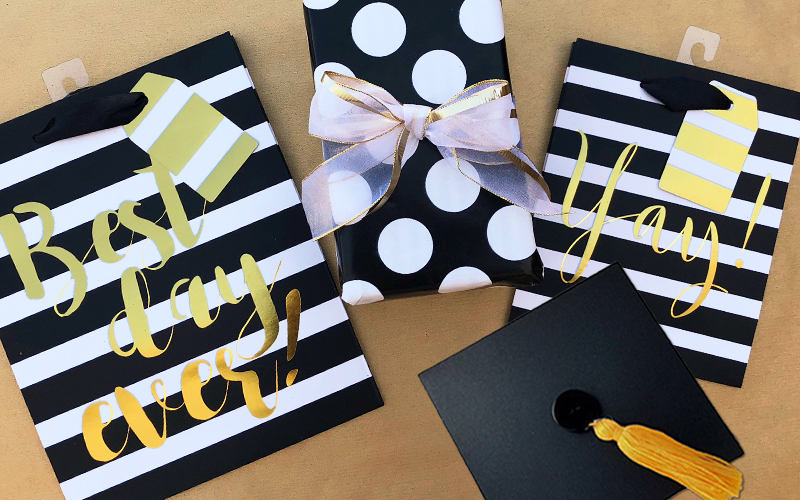 Here are a few ways to make your gifts to the graduates in your life sophisticated and chic. Yay grads! Happy Holidays! 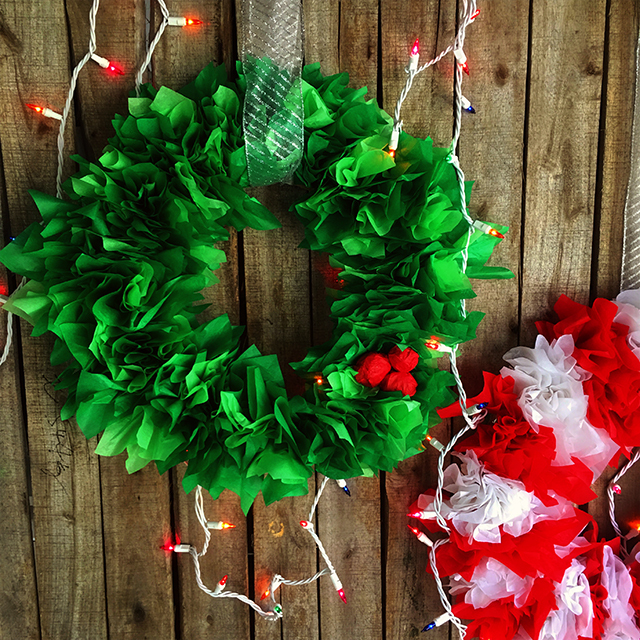 To make the office a bit more festive we decided to made some easy wreaths from our Jillson & Roberts tissue paper. 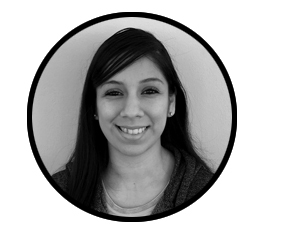 The process was simple and we love how they turned out! 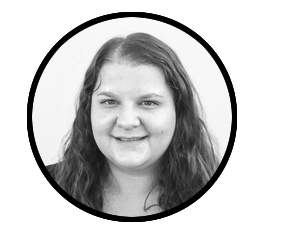 To make your own, first cut a wreath shape out of cardboard in the desired size – our finished wreaths are about 18″ in diameter. 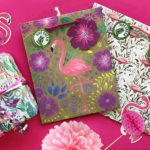 Then cut 5″ squares of tissue paper in your chosen colors. For the green wreath we used FT13 and FT35, with FT09 for the berries. The red and white is FT09 and FT24. Then take each tissue square, pinch the bottom center, and pull all the edges up together to form a cone like puff. 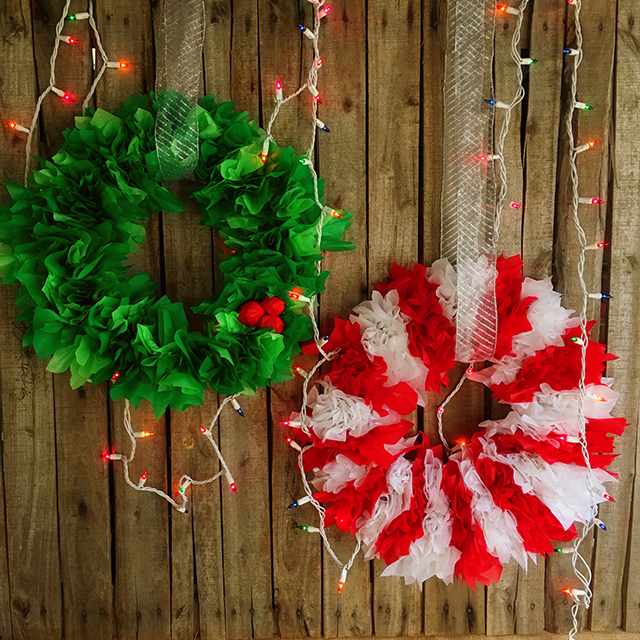 Once you have a bunch of these made, lay down double sided tape all over one side of the cardboard wreath and stick down the bottom center of each tissue puff until you achieve the desired fullness on your wreath. For the red/white wreath we alternated between using red and white tissue to form stripes. 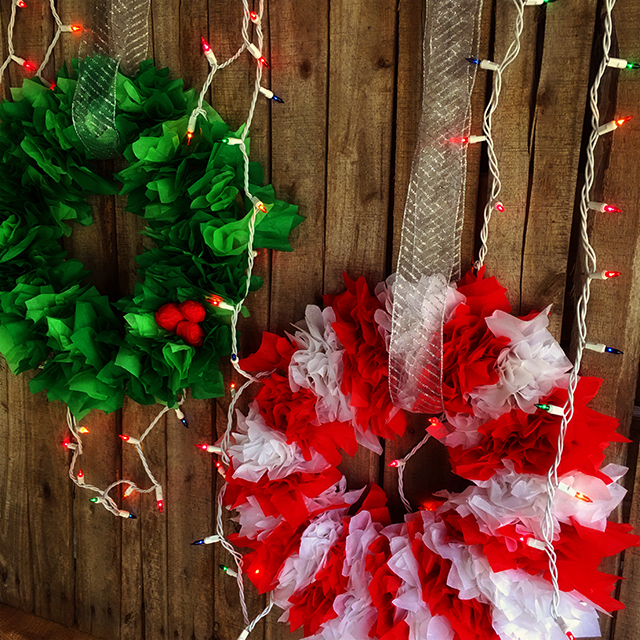 Once done hang with a ribbon of your choice – we used FR5924. Perfect to add some DIY decor to your store or home! 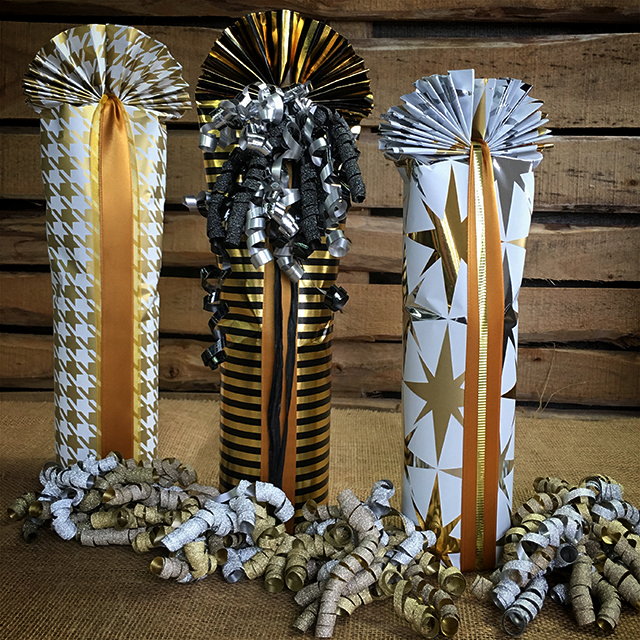 We’re back with part 2 of our holiday season bottle wrapping inspiration! 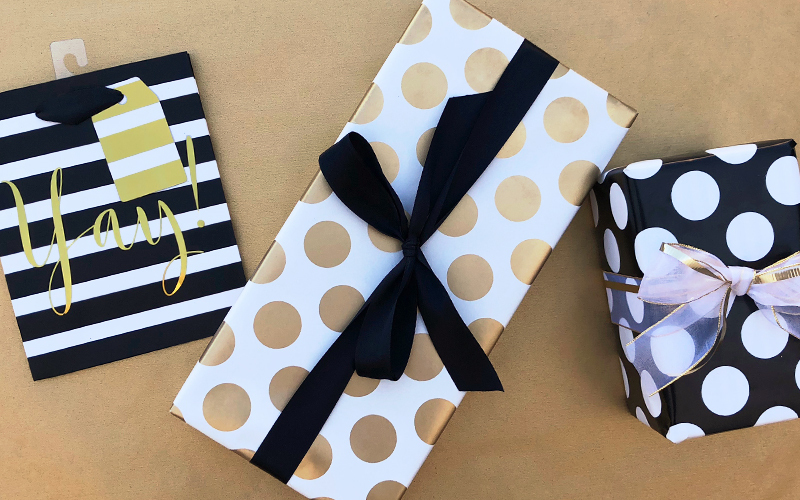 We love seeing all the ways Jillson & Roberts products can transform a simple bottle into an extraordinary gift. We can’t wait to put these ideas to use over the coming weeks as we enjoy time with family and friends! 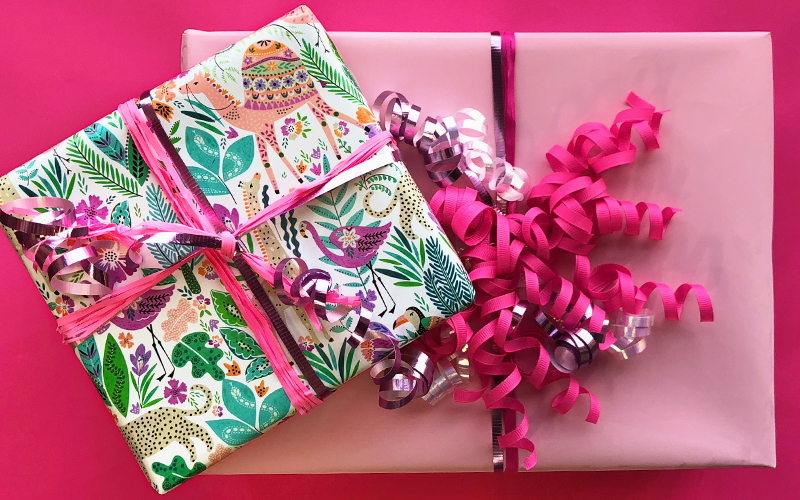 This great wrapping idea is from one of our designers, Rachel. 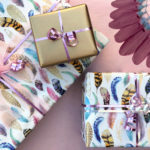 She used a mix of paper and tissue to create a unique and elegantly wrapped present that could work for a multitude of occasions! 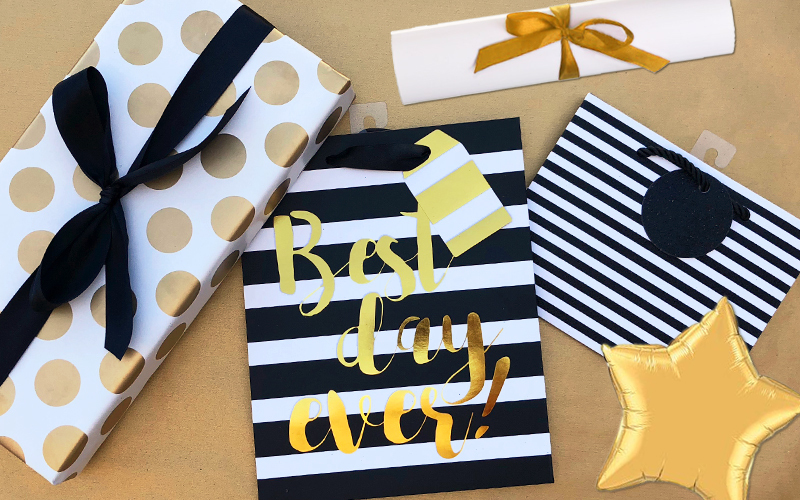 To create the look she used silver and gold striped tissue (PT337), glittered paper (R419), gold ribbed paper (R995), and some black and gold ribbon (FR1021+FR0921). 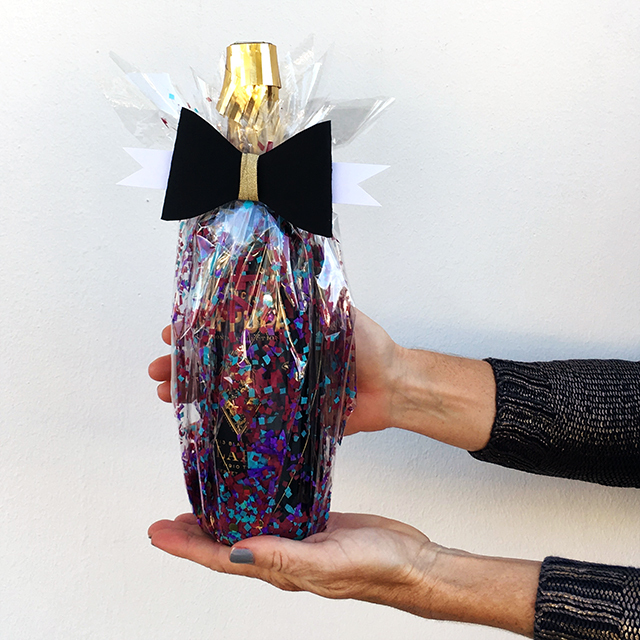 Our order entry expert Jessica wrapped a bottle to gift at a winter wedding. She used three tissues (PT337, MM15, RT15), and one of our gorgeous glittered curlies (CL83). 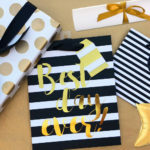 The result will make your wedding gift a hit for sure! 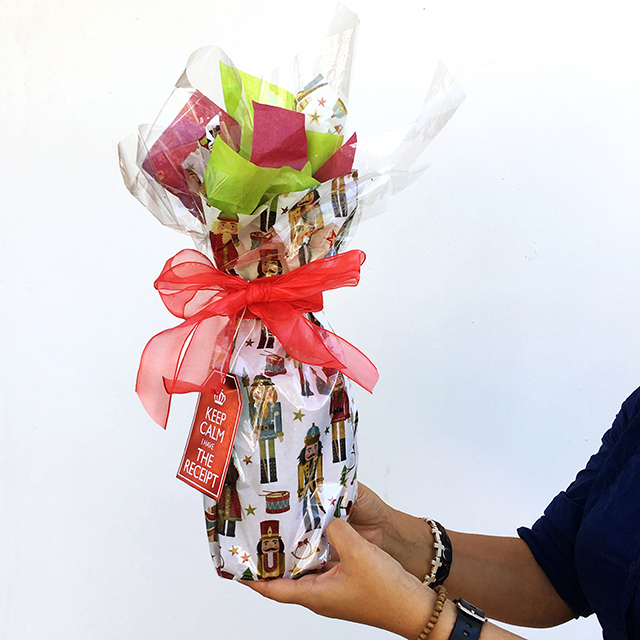 Our Purchaser, Marlen, made a gift perfect for a Christmas party! She used Clear Cello (CE829) lined with our Traditional Nutcracker Tissue (XPT611). Then finished it off with a bow (FR3209) and foil tag (XST525)! Guaranteed to bring some Christmas cheer to any party! 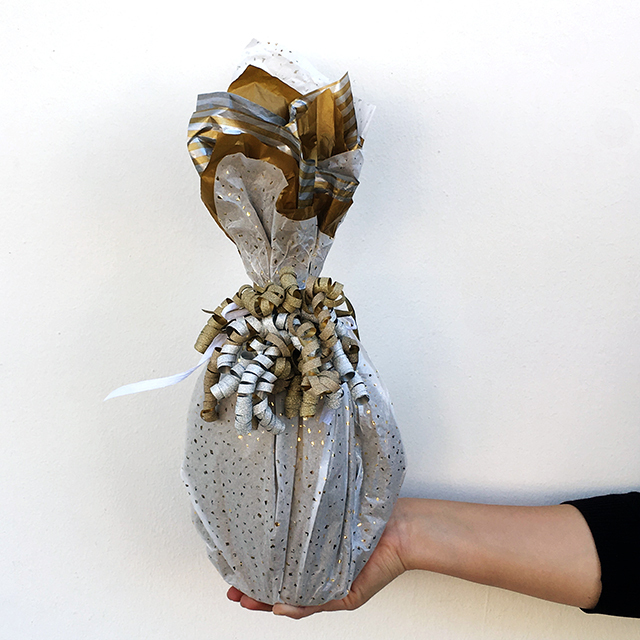 Our Sales Administrator Maggie wrapped her bottle for a New Years party! 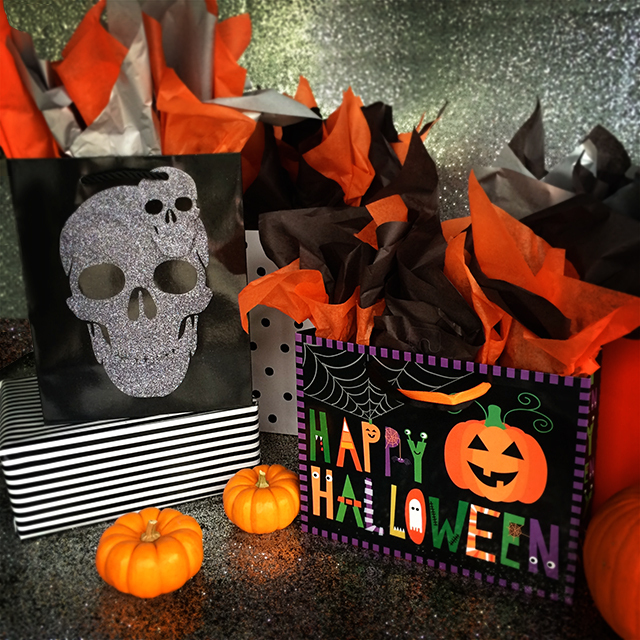 She used some Silver Black Chevron and Solid Black tissues (BPT421+FT21) Paired with wide Black Satin ribbon (FR1121) and topped it off with a perfectly festive sheet of stickers (XS7606)! 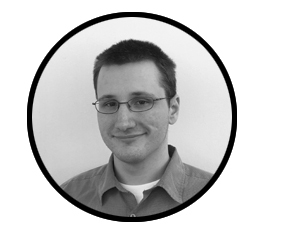 First up we have Thanksgiving! 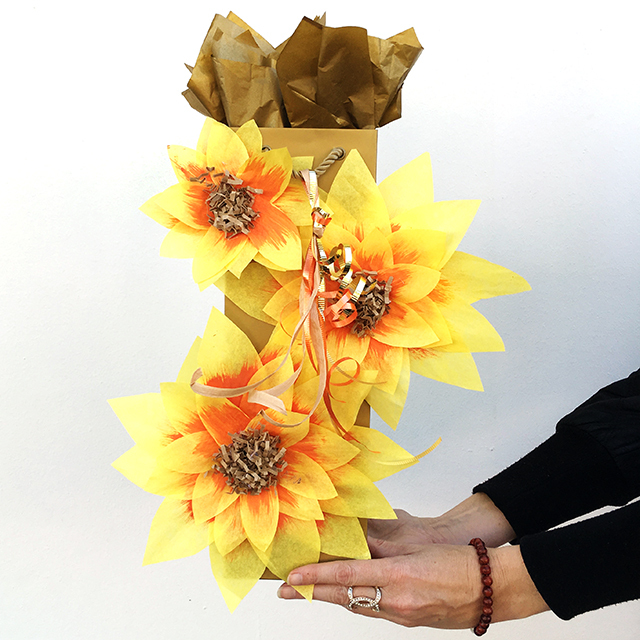 It’s right around the corner and one of our designers, Laura, used some Yellow tissue and Natural crinkle (FT12+CS18) along with some paint to make sunflowers. Then attached them to our Metallic Gold bottle tote (BT915), added some Metallic Gold tissue (MM15) and completed the look with a tassel made from raffia and curling ribbon (PR18, MC15, PC27). Perfect to show thanks to your hostess on Thanksgiving or for any Fall dinner party! 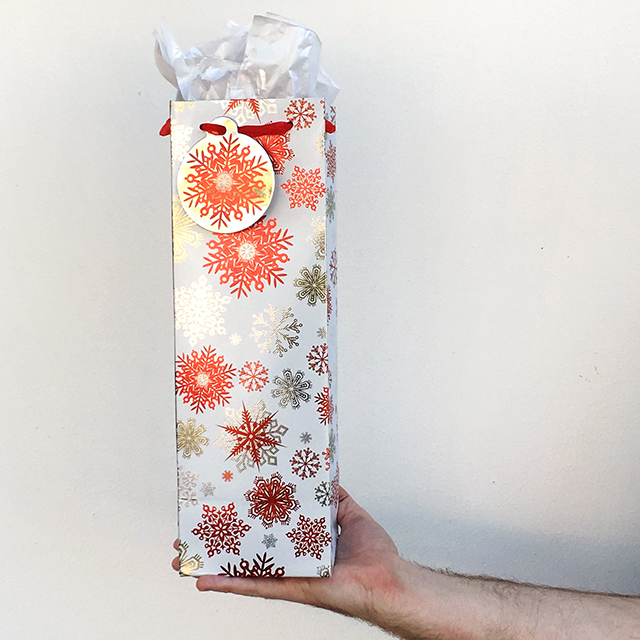 Our Customer Service Manager Ryan, prepped his bottle to be the perfect gift at a winter Birthday party! He used our gorgeous holographic Sparkleflake bottle tote (XBT676) paired with a simple white tissue (FT24). 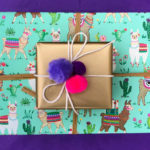 Perfect to celebrate a birthday or other winter gathering! 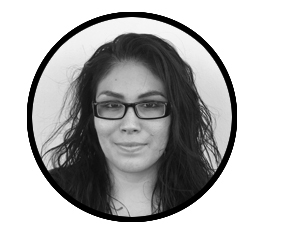 Our Art Director, Janel, made her bottle black tie ready! Perfect for a fancy soiree or wedding! She used our Clear Cello (CE829) and added clippings from various colored tissues to make an amazing confetti effect. Paired with a black and white paper bow tie and some gold ribbon it’s definitely a show stopper! 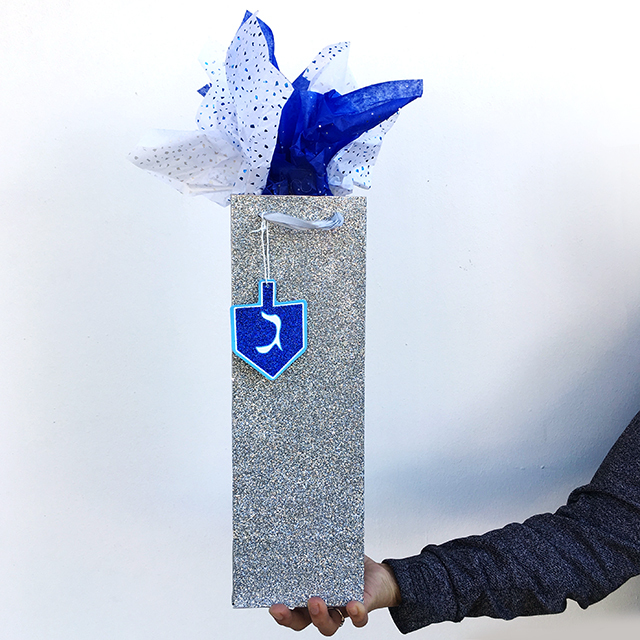 Our Order Entry Specialist, Nataly, made a picture perfect gift for a Hanukkah celebration! She used our Silver Sparkle tote (BT750) paired with metallic tissues (GS16+RT16). And topped it off with a sparkling Happy Hanukkah gift tag (XST701). Perfect to celebrate the Festival of Lights with friends and family! To Be Continued!!! 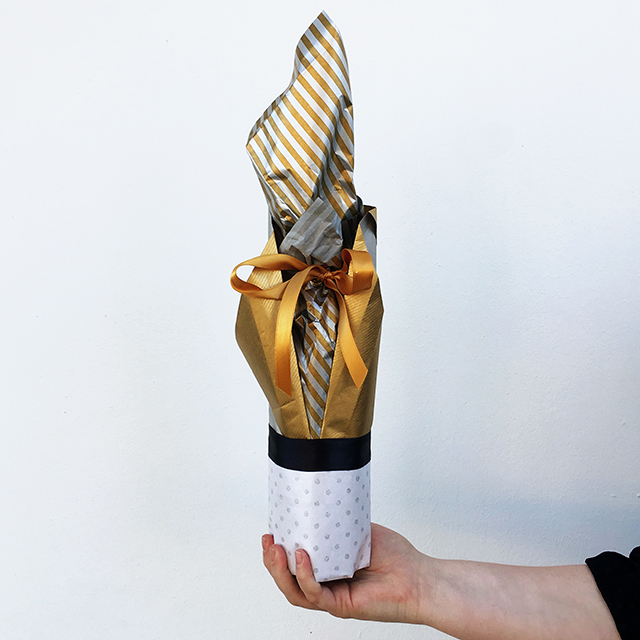 Next week we will show some more of our teams perfectly wrapped bottles! 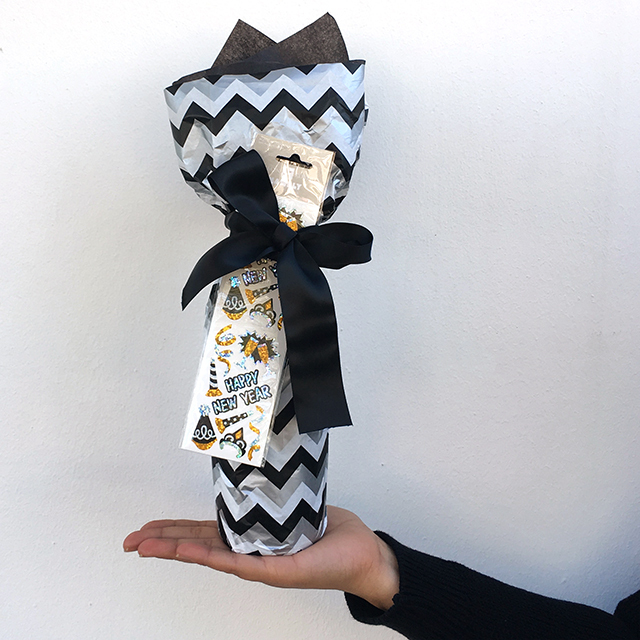 We recently spotted a brilliant idea for how to wrap a wine bottle over on Spoon Fork Bacon’s blog! 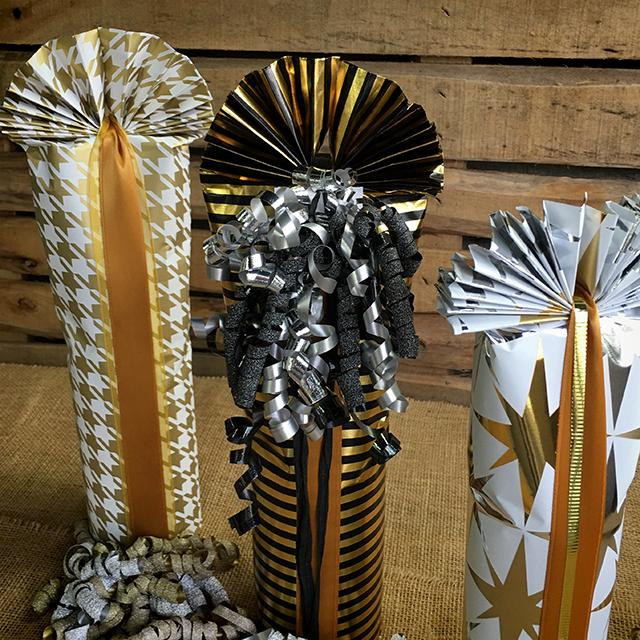 They have some great instructions on how to achieve this simple, pleated top, bottle wrapping solution! 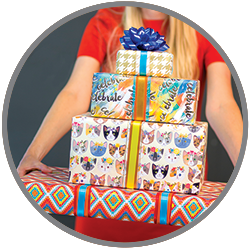 Used above is Jillson and Roberts R498, R437, and XR839 wrapping paper. Along with FR1015, FR3215, MC15, CL82, and CL83 for embellishment. Perfect for all those dinner parties that come up during the holiday season! 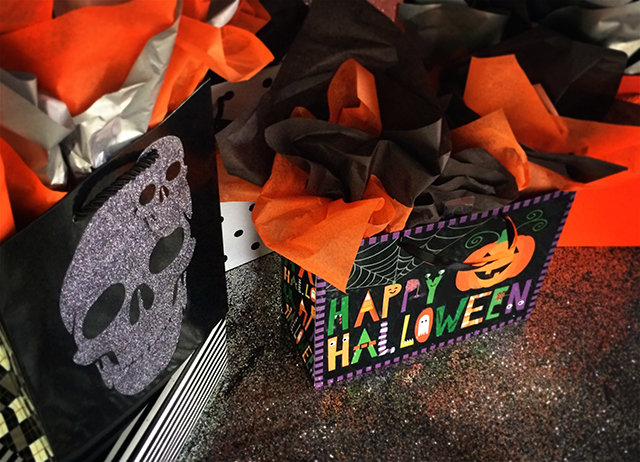 Halloween is in the air as the big weekend is quickly approaching! Just in case you are looking for any last minute costume ideas we wanted to share a little inspiration from around our office last Halloween. 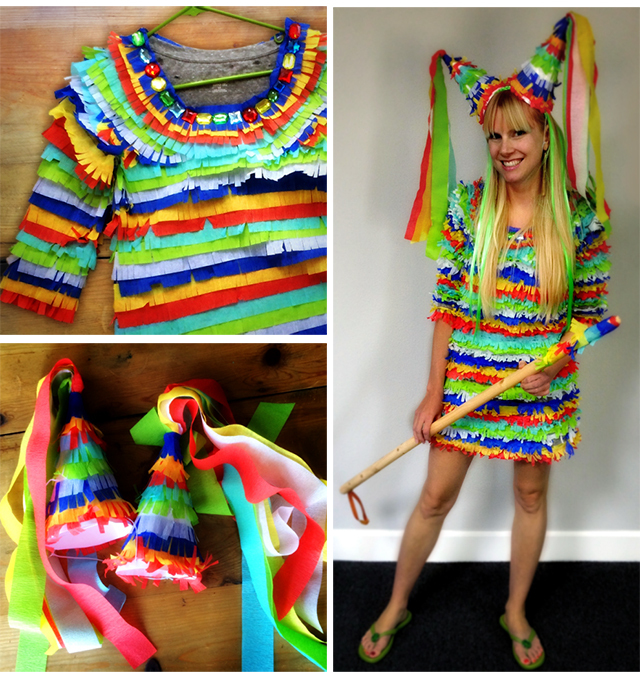 This piñata costume is a great way to use our beautifully colored J&R solid tissue! 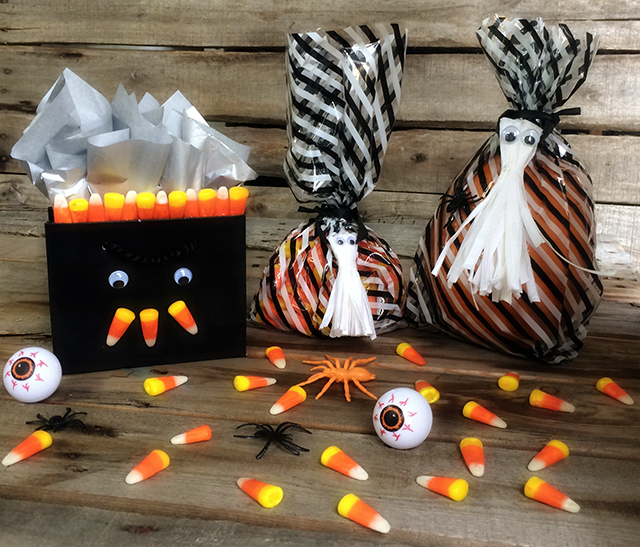 Wishing everyone a week filled with lots of treats, and maybe a few tricks! 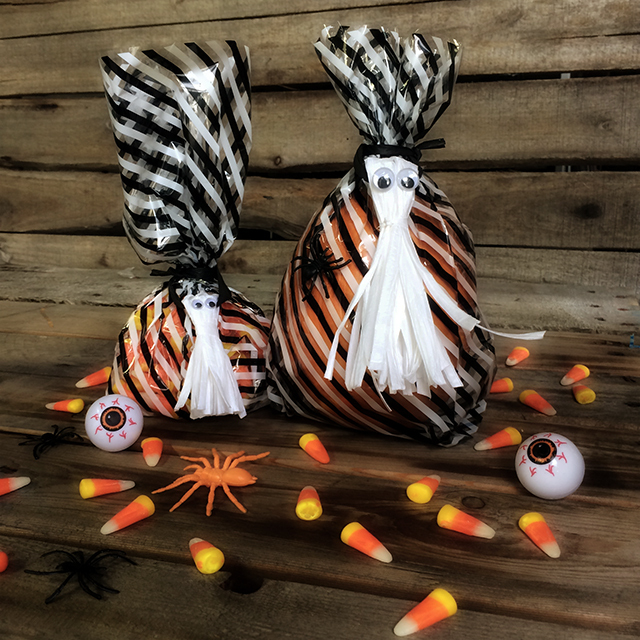 A great way to hand out treats at your next party, or to all those cute little ghouls coming to your door on the 31st, is with some of our J&R cello! We used LC421 and decorated them with some raffia (PR24) tassel ghosts. 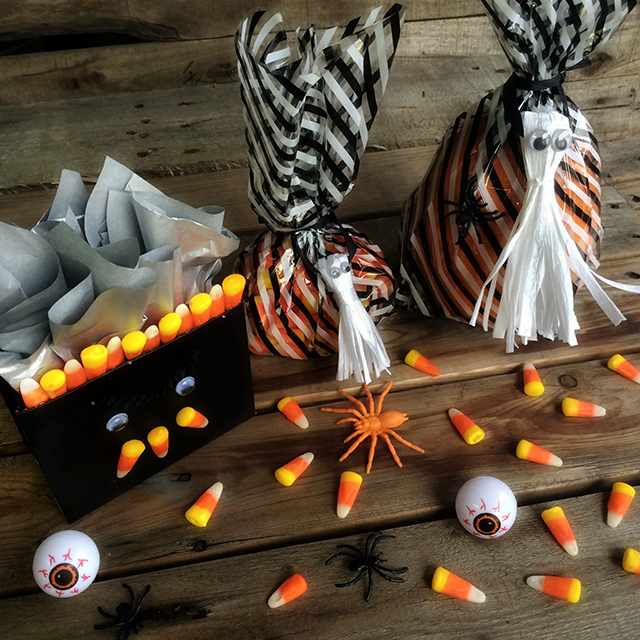 Tiny totes in fall colors also make great treat bags! 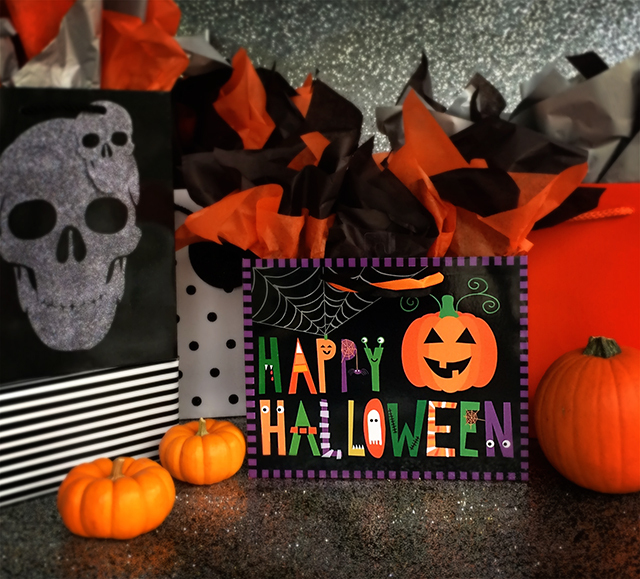 With October 31st right around the corner it’s the perfect time to grab some of J&R’s spookier totes…Perfect for gift giving or to use as a stylish trick-or-treat bag! Shown below are MT496, MT435, MT421, and LT927. And tissues, FT21, FT27, and MM14. Happy early Halloween! Fall is Here! It’s time for pumpkin everything (especially pies and lattes…)! 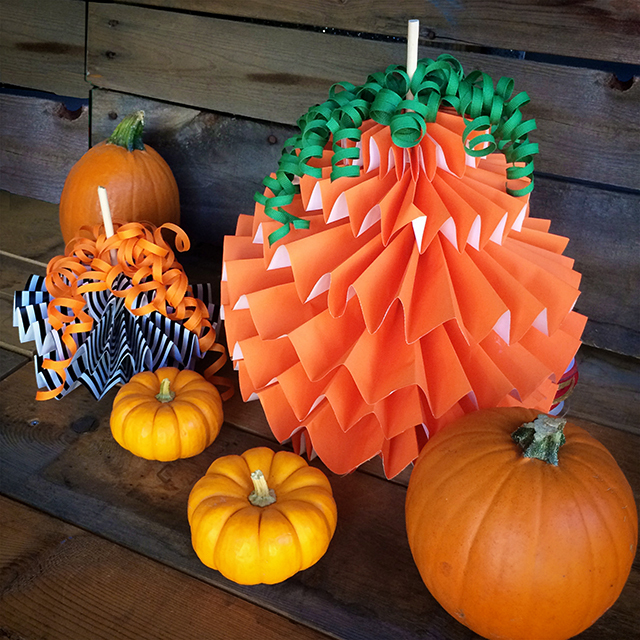 To spice up the office we made some paper pumpkins from J&R wraps (R927 + R449) and grosgrain curlies (GL922 + GL927). 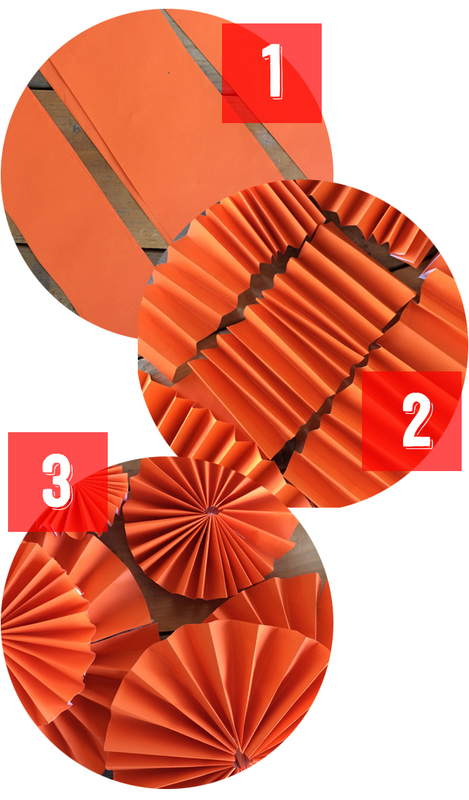 To make some yourself cut strips of wrap in various widths, pleat and make into paper fan circles. 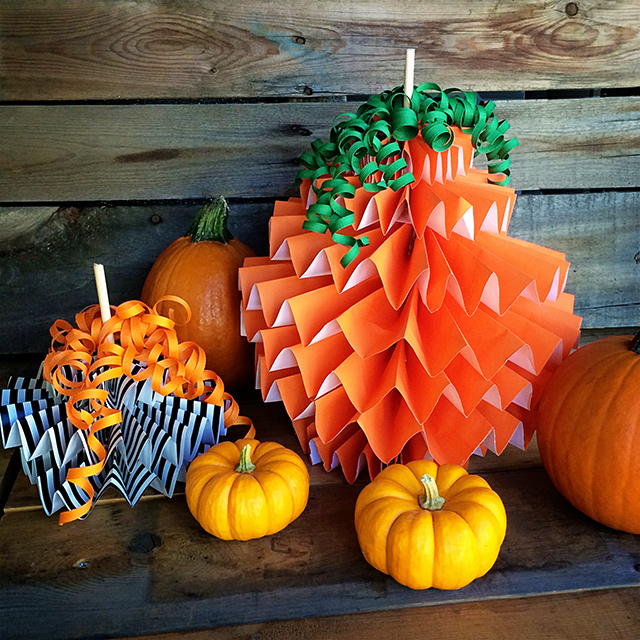 Stack and glue to form a pumpkin shape. Then add a stick or dowel for the stem and curlies for leaves! Perfect fall decor for your store or home! 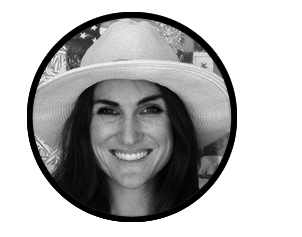 Hello & welcome to the Jillson & Roberts Blog. 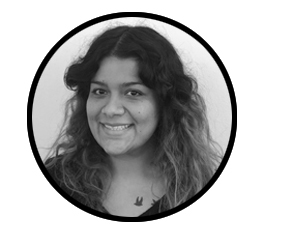 This is our space to share inspiring projects using products from our collection! 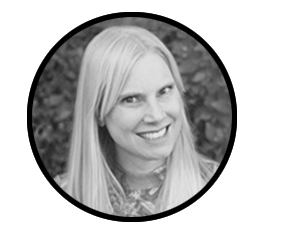 Join our mailing list to keep up with the latest happenings at Jillson & Roberts! 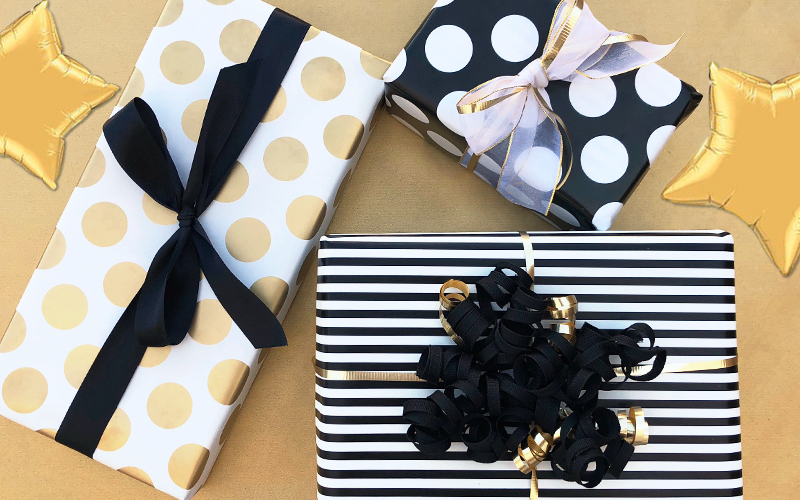 Almost four decades ago Jillson & Roberts was founded with the idea of providing premium quality fashion-oriented gift wrap and accessories, along with superior service, to retailers throughout the U.S. and Canada. We hold to that same idea today and we have added one major commitment: To be environmentally sensitive! Ⓒ2018 Jillson & Roberts. All Rights Reserved.